THAT'S 'DR. 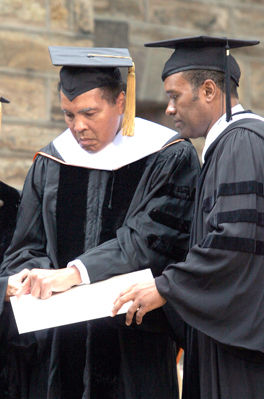 CHAMP' TO YOU: Three-time World Heavyweight Champion boxer Muhammad Ali was one of seven individuals to receive an honorary doctoral degree Tuesday, at Princeton University's 260th Commencement exercises. In all, the University awarded degrees to 1,127 undergraduates and 716 graduates in front of an estimated crowd of 7,000. Princeton Borough Mayor Mildred Trotman handily defeated Democratic primary challenger Kim Pimley Tuesday in the first primary mayoral election since 2003. Princeton University President Shirley Tilghman Tuesday slammed a 2006 U.S. Department of Education study that urges measuring the growth of student learning in college and devising a framework built from quality assessment data in gauging the academic aptitude of the nation's colleges and universities. An appellate division of the state Supreme Court ruled last Wednesday that a privately owned eating club serving members of Princeton University's student and alumni population could receive more than $320,000 in county, school, and municipal back taxes  a decisive victory for the club, and a potentially devastating blow to Borough Hall, as well as Borough taxpayers. Princeton resident and John Witherspoon Middle School teacher, Constance Killian Escher, received one of three Exemplary Practices Awards from the New Jersey Amistad Commission at its third annual awards ceremony and reception at Drumthwacket, the Governor's mansion, last Thursday, May 31. A cluster of mid-20th century houses last week came one step closer to officially acquiring the "historic" tag when a Township municipal commission signed off on an outsourced study recommending historic status, and the protections and building limitations that go along with it. At least a dozen times a year, there is a chance to walk along the towpath of the Delaware & Raritan canal by the light of a full moon  that is if the weather cooperates with a clear sky. Courtney Banghart knows a little something about beating up on the Princeton University women's basketball team. Coming into last week's state Group II semifinal clash as West Morris Central, the Princeton High boys' lacrosse team had the sense that it hadn't yet produced its 'A-game' this spring. James Smirk wasn't sure whether his Princeton High girls' track team was destined to develop into a powerhouse this spring.